Porcelain Crowns, also known as 'Caps', are coverings which are made to fit over damaged teeth. Crowns improve the appearance of malformed, mispositioned, discoloured and decayed teeth. They are particularly useful for chipped or fractured teeth or broken down fillings. Crowns are usually made of porcelain and or metal and look totally natural compared with the surrounding teeth. When bridge work is done, crowns are required for the anchoring teeth in order to provide support for the replacement teeth. After root canal is performed, teeth can be more prone to damage as they tend to weaken. For this reason, crowns are used to give teeth support and strength. When there becomes more filling than tooth, the remaining tooth becomes brittle and can no longer keep the filling in place. Usually, a minimum of 2 appointments are required for the fitting of a crown. In the first appointment, an impression of the tooth is made, necessary preparation of the damaged tooth is done and a temporary cap is fitted. In the subsequent visit, the temporary cap is taken off and the permanent crown adjusted and firmly fitted into place. 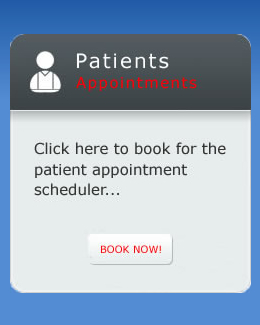 At the first appointment you will be required to go under local anesthetic. The effects can last one to four hours, sometimes even longer. While under anesthetic, do not chew at or bite your tongue or lips- children need to be closely supervised in this regard. While the effects remain after the appointment, it is advised not to try eat a meal until the effects have completely worn off. The first thing the dentist does is prepare the tooth for the crown to best retain it once fitted. This is then followed by creating an impression of the tooth. Once the impression is completed, a temporary acrylic crown (or bridge if multiple teeth are involved) is fitted- these are used to protect the damaged tooth and gum tissue between dental visits and are easily removed. It is of vital importance to the final success of the treatment, that regular, normal daily maintenance of the teeth, including the temporary crown, be kept. Brushing will not damage the crown but not brushing certainly will cause damage to teeth and gums. Temporary crowns or bridges do sometimes come adrift in between dental visits. It must be replaced as soon as possible! Do not leave it for your next appointment. The surrounding teeth can move in quite a short space of time and this will compromise the fitting of the final crown and another impression may have to be made. To improve the grasp of the temporary crown, use a small amount of Vaseline in the cap. If in the event you really cannot refit the temporary crown, put it away and call us immediately. We will schedule you in as soon as possible to refit it. The temporary crown and any temporary cement is removed and cleaned from the prepared tooth. 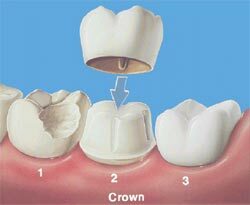 The final prepared crown is then adjusted, fitted, checked and evaluated in terms of accuracy and aesthetics. Once the dentist is content that everything is in place, the crown is cemented to your tooth. Following the second appointment, subsequent alterations may need to be made if continued discomfort or severe sensitivity is experienced. Although, it is normal that some sensitivity to the cold does occur for a few weeks after the procedure. We hope that this outline and instruction sheet will give you a good understanding of the process of inserting a crown. Following these simple guidelines will help provide you with the finest in dental care.